Link Wary, acknowledged inventor of the power chord and father of rock 'n' roll minimalism... a legend for almost fifty years. This CD is all new recordings, six instros and seven vocals. It's all heavy duty Link Wray. Two of the tracks were from a previously unreleased 1977 live session. 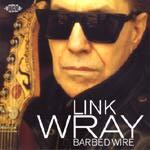 A must for any Link Wray fan. "Rumble," "Born To Be Wild" and "Fire" are magnificent. "Julie Baby" is a dirty guitar chord monster, with a solid beat and lots of edge. In the grand tradition of the Linkster, this rocks and grinds as well it should. Not a gentle note on board, though the break is soft spoken. Mis-titled for sure, "Hard Rock" is a soft spoken chorded number with a nifty back beat. Acoustic guitars and a rockabilly feel. Quite infectious. Ultra harsh chicken bop, with those cluckin' licks and lots of drivin' edge, and even a few glissandoes. The Linkster sure knows how to make his ax do the down and dirty! A very pretty solo guitar piece, in an almost finger pickin' style. The warmth and sadness of the tune seem to compliment each other. Not quite Spanish, yet a bit of Flamenco here and there. Big guitar slammin' Link Wray power chord chunka chunka... a monster looking for YOU! A relentless progression chases you down and nails you to the floor. The whammy/feedback action in the middle is ultra cool. This spectacular rendition of Link's most famous tune cries and groans and stretched for the sky... mid session, Link shouts to bring the guitar up in the monitors. This is a marvelous performance recorded on January 15, 1975 at the Garage in London.